Product prices and availability are accurate as of 2019-04-19 03:06:11 UTC and are subject to change. Any price and availability information displayed on http://www.amazon.co.uk/ at the time of purchase will apply to the purchase of this product. The All Pets Go To Heaven: The spiritual lives of the animals we love is a beautiful book written by a psychic to bring comfort to those who have lost their beloved pet. This book shows us how our pets can still be with us even after their death and provides wonderful, heartwarming stories of loyalty, companionship and the humerous actions of our fur babies. We hope this book provides comfort for you or your loved one through their grief and loss. The death of a pet is always a heart wrenching event. 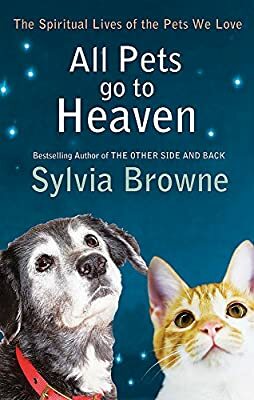 But in ALL PETS GO TO HEAVEN, Sylvia Browne uses her special psychic gift to provide comfort for those grieving over the loss of a beloved animal by showing how pets continue to be with us even after their deaths. Sylvia uses four decades' worth of research and true stories from her extraordinary career to reveal the psychic abilities of cats, dogs, horses and other creatures that have shared our homes and our hearts. She describes the unique personalities, quirks, habits and emotions that provide them with a soul. She explains how animals live on beyond the grave, and gives readers a unique peek into heartwarming tales of never-ending loyalty, heroic deeds and comic behaviour that show that pets are true human companions on both sides of life.